A year ago, the Michigan Department of Technology, Management & Budget (DTMB) released its outlook for project job growth through 2024 for the East Michigan region, an area comprised of Genesee, Shiawassee, Lapeer, St. Clair, Sanilac, Tuscola and Huron counties. The demand occupations – or “hot jobs,” as labeled in the report – are those that show a favorable mix of long-term growth, projected annual openings and median wages through the middle of the next decade. Of the 25 occupations listed, 10 are in the healthand wellness field – from dental practitioners to occupational and physical therapists to surgeons and registered nurses. In fact, nursing, with an hourly wage range of $30-$37, had the highest number of projected annual openings with 198 for the period. That’s great news for Flint & Genesee, where nearly 60 percent of the health care practitioners in Michigan’s East Region are located in Genesee County. We’re fortunate to have three major hospitals – Ascension Genesys Hospital, McLaren Flint (named one of Michigan’s top hospitals by U.S. News & World Report) and Hurley Medical Center, a Level I Trauma Center and Level II Pediatric Trauma Center. In addition, McLaren Health Care, McLaren Flint’s parent company, and Diplomat Specialty Pharmacy, the nation’s largest independent provider of specialty pharmacy and infusion services, are based here. Meanwhile, the University of Michigan-Flint, Michigan State University College of Human Medicine, Mott Community College, Baker College of Flint and Kettering University offer training and degree programs in health sciences, providing a talent pipeline for health care employers and allied providers. Opportunities are expected elsewhere in the labor market. For instance, the need for licensed heavy and tractor trailer truck drivers is projected to grow nearly 12 percent in the region by 2024. The nexus of three interstates – I-75, I-69 and U.S.-23 – combined with the Canadian National Railway and Bishop International Airport form an intermodal hub. This allows for products to be shipped by air or rail before being loaded onto a semi-truck. Wages in the trucking industry can range from $14-$22 an hour. Double-digit growth is also anticipated in the skilled trades – notably electricians (15.2 percent), plumbers/pipefitters (10.4 percent) and CNC operators (23.1 percent) – where the wages rival some of those in the health care industry. A thriving, vibrant community depends upon a healthy and competitive business environment. Moreover, businesses need talent. Helping to identify and nurture talent, whether by working in tandem with our primary, secondary and post-secondary educational institutions, or with the region’s workforce development agencies, is a central component of the economic development strategy for Flint & Genesee. We believe this approach benefits not just our business and corporate citizens but our private citizens, too. 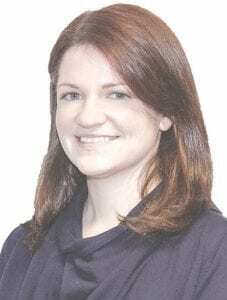 Kristina Johnston is a group vice president for the Flint & Genesee Chamber, with oversight for economic development.